This mushroom risotto recipe is one of the most delicious variations on the basic risotto recipe.Making mushroom risotto involves stirring hot stock into the uncooked rice a ladleful at a time and cooking slowly as the stock is absorbed. 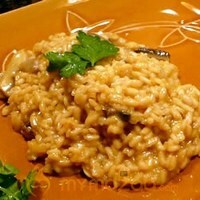 This technique, called the risotto method, releases the rice's starches, making a creamy, velvety dish.The real magic in this mushroom risotto recipe comes from using mushroom stock, but vegetable stock can be substituted. 1 Heat Olive Oil in a large skillet over medium-high heat. 2 Saute the Onion and Garlic in the Olive Oil unTil Onion is tender and Garlic is lightly browned. 3 Remove Garlic, and stir in the Parsley, Celery, Salt, and Pepper. 4 Cook unTil Celery is tender, then add the Mushrooms. 5 Reduce heat to low, and continue cooking unTil the Mushrooms are soft. 6 Pour the Milk and Cream into the skillet, and stir in the Rice. 7 Heat to a simmer. 8 Stir the vegetable stock into the Rice one cup at a time, unTil it is absorbed. 9 When the Rice has finished cooking, stir in the Butter and Parmesan Cheese, and remove from heat.